Soft Cover, 270 pages, 9 x 6. A fantastic guide to Pennsylvania's breweries and brewpubs, from A (Appalachian Brewing Co.) to Y (Yuengling & Son, founded 1829). Sorry -- no Z's. But you won't be disappointed. This is the newly-revised Third Edition. Tourists and beer lovers will learn about the history, current output, and types of beer produced at every brewery in the state, as well as information on tours, food served, and nearby lodging and attractions. This is the ultimate guide for brewery-hopping in the great beer state of Pennsylvania. 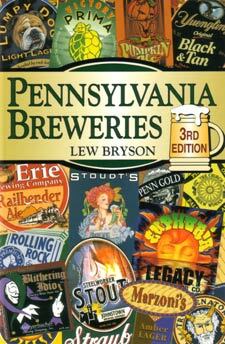 American Breweriana Journal says, "Pennsylvania Breweries is written in a friendly conversational style, as if the author himself is conducting the tour. Don't travel the Keystone State without it."